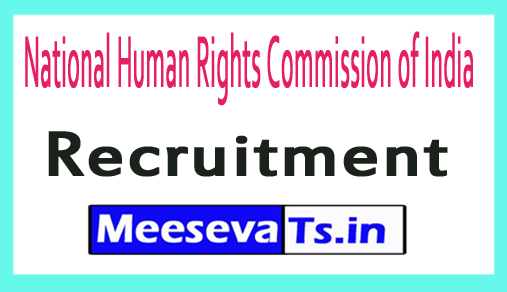 2018 recruitment of the NHRC: the National Human Rights Commission of India has published the official announcement of the 17 vacancies of assistant, private secretary, accountant. Suitable and trained candidates can submit the 2018 National Human Rights Commission Application Form 2018 in offline mode from their official website nhrc.nic.in. Interested candidates can apply online until the last date, 26-09-2018, for the NHRC Assistant, the Private Secretary, the vacant Accountant 2018. Applicants can download the official notification from the official website before requesting this job. Further information on the hiring of the National Human Rights Commission of India, eg. Eg eligibility, educational qualification, age limit, selection process, application fee and application form, important links, curriculum, admission cards, results, previous documents. The selected candidates receive Rs. 9300 - 34800 / - With 4600/4200 / - Payments (release 1,4,6), Rs. 15600 - 39100 / - With 5400/6600 / - Payments (release 2,3,6), Rs. 5200 - 20200 / - With 1900 / salary (Post 7) ​​of the organization. Interested and eligible applicants may download the required form from the nhrc.nic.in website and submit their application form before 26.09.2018. The prescribed format along with the photocopy of all relevant documents should be sent to the address below. Deputy Secretary (Est.) National Human Rights Commission, Manav Adhikar Bhawan, C-Block, GPO Complex, INA, New Delhi - 110 023. Senior Research Officer: Master's degree with 4 years experience. Research Fellow: Master's degree with 3 years experience. Research Associate Mr.: Master's degree with 2 years of research experience. Interested and Eligible applicants may download the required form from the nhrc.nic.in website and submit their application form by 05-09-2018. The prescribed form along with a photocopy of all relevant documents should be sent to the address below.